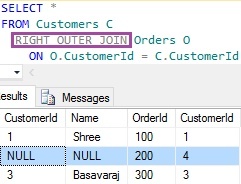 This article provides a comparative analysis of the Sql Server LEFT OUTER JOIN and RIGHT OUTER JOIN with extensive list of examples. LEFT OUTER JOIN / LEFT JOIN returns all the rows from the LEFT table and the corresponding matching rows from the right table. If right table doesn’t have the matching record then for such records right table column will have NULL value in the result. RIGHT OUTER JOIN / RIGHT JOIN returns all the rows from the RIGHT table and the corresponding matching rows from the left table. If left table doesn’t have the matching record then for such records left table column will have NULL value in the result. From the execution plan we can see that first all records from the LEFT TABLE (i.e. Customers) of the JOIN clause are fetched. Then for each of these LEFT TABLE (i.e. 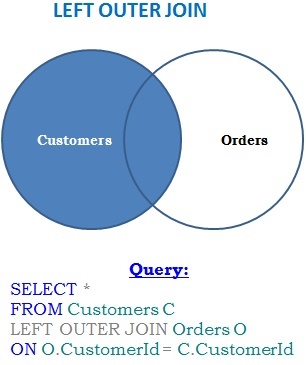 Customers) records, it is trying to fetch the matching data from the RIGHT TABLE (i.e. Orders TABLE) using Nested Loops LEFT OUTER JOIN operation. 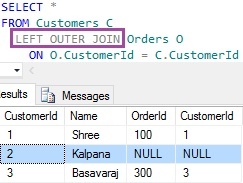 So, to get the result from LEFT OUTER JOIN which is same as that of RIGHT OUTER JOIN and vice-versa, we just need to switch the order in which the tables appear in the JOIN clause. The main difference between LEFT OUTER JOIN and RIGHT OUTER JOIN is: LEFT OUTER JOIN returns all records from the LEFT table irrespective of whether there are any matching rows in the RIGHT table. Where as RIGHT OUTER JOIN returns all records from the RIGHT table irrespective of whether there are any matching rows in the LEFT table. 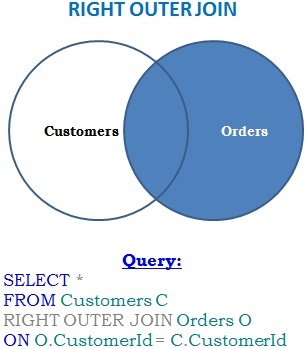 To get the result from LEFT OUTER JOIN which is same as that of RIGHT OUTER JOIN and vice-versa, we just need to switch the order in which the tables appear in the JOIN clause.